Ghostly-goings-on aplenty to make the stauchest mariner wish he'd stayed ashore. Publisher's blurb: "Ghost ships and abandoned coastal villages fill a bard's songbook, bringing tales of reaving pirates, brutal slavers, plagues and pure mystery. The flotsam and jetsam of those lost and broken lives leaves its psychic imprint on the surrounding world, creating the terrible haunts found on empty ships and deserted piers. "Do your Pathfinder Roleplaying Game heroes have the stomach to delve into these forlorn locales? Can they unravel the key to ending the Star-Cursed Sky and return safely to port? Will they learn what must be done to stop the Deep Ones' Rise while fending off a ghostly boarding? Do they have what it takes to bring about the destruction of the Bloody Tide? "Additionally, these 30 haunts weave through the tale of Greycliff's corruption and the rise of Bellfall, telling of the Fog Reavers' savagery and their final fate - providing the bare, scavenger-gnawed bones of dark maritime adventure with challenges for parties from levels 1st to 12th. 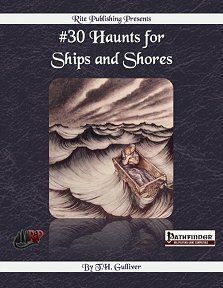 Bring the terror of the past to the present of your Pathfinder Roleplaying Game with #30 Haunts for Ships and Shores!"